Gus MacPherson feels that leading amateurs Queen's Park to promotion almost matches his achievements as manager of St Mirren. The Spiders finished fourth in Scottish League Two but defeated Cowdenbeath then Clyde in the play-offs to end a seven-year spell in the bottom tier. MacPherson previously led St Mirren to the top flight and kept them there. "That's probably the biggest achievement, but this is probably a close second," said the head coach. "This is up there with keeping St Mirren in the Premier League, which was one hell of an achievement with the resources that we had that first season." Queen's Park bosses are used to having to rebuild their squad each summer as their players are attracted to senior, or even junior, clubs able to pay them for their services. But MacPherson, who took charge in 2014, is hopeful of retaining more than usual, even though some, like 17-year-old midfielder Liam Brown, are attracting attention from other clubs. "That's the frustrating aspect of it," said the 47-year-old after the 3-2 aggregate win over Clyde. "Liam is only 17 and already attracting interest and he's got a big future in the game. "He's been given his opportunity and he's not looked back and I'm looking forward to working with him." MacPherson, who spent seven years with St Mirren before also managing Queen of the South, is hoping that playing their home games at Hampden Park, the national stadium, will help persuade players to stay. "We would hope that we could retain quite a few of them, because that is the challenge - to go and play at a higher level - and where else has facilities like this, whether it be Hampden or Lesser Hampden?" he told BBC Scotland. "It is well documented how we try to recruit players - this is a selling point. "You see the reaction of players who get to score goals in this arena and have watched international players of the past doing it and probably only dreamed of doing it themselves." 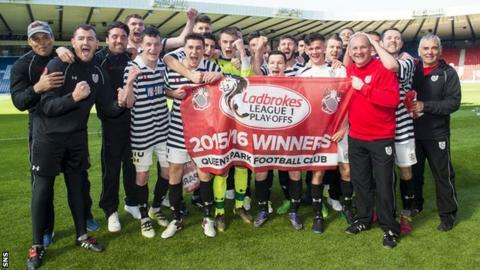 Queen's Park not only relegated Cowdenbeath, who had finished second bottom in League One, but overcame a Clyde side who had finished a place above the Spiders in League Two. "It would have been a travesty if we hadn't got up," added MacPherson, whose side survived a 1-0 second-leg defeat by the Bully Wee. "The way we try to play and the quality within that group, from the level they have came from, the team spirit, the way they work, they are a credit to themselves. "They know the facilities that we've got, the team spirit that's been built up and hopefully they look at this, they remember it, they enjoy it and they look forward to coming back."